Over the weekend, you may have stumbled across a few headlines that left you scratching your head. Several stories from reputable sources with titles along the lines of “Scientists say sniffing farts could prevent cancer” went viral for obvious reasons. The truth of the matter is that smelling flatulence will not prevent cancer. Delving further, we can see that some of the confusion may have been sparked by an observation made by Dr. Mark Wood of Exeter’s biosciences department. The good doctor had remarked on hydrogen sulfide’s (the gas that gives flatulence its foul smell) potential as an agent in future cancer therapies. The press release was based on an article published in Medicinal Chemistry Communications, but it was not about sniffing a fart or preventing diseases for that matter. The original story was about a compound labeled AP39. Scientists had gotten AP39 to transport small levels of hydrogen sulfide to mitochondria. The mitochondria makes use of extremely small doses of hydrogen sulfide to keep functioning optimally when under threat from a disease. Without access to hydrogen sulfide, the mitochondria will lose their ability to function and perish. “Our results indicate that if stressed cells are treated with AP39, mitochondria are protected and cells stay alive,” explained co author Professor Matt Whiteman. Researchers looking into the regulatory role of hydrogen sulfide have only been able to use cells from mice or those grown in petri dishes, but the research has shown a lot promise already. Dr. Csaba Szabo, a professor of anesthesiology at the University of Texas in Galveston has been adamant about its potential. But he is worried that social media could turn this work into a joke pretty quickly. Dr. Szabo worked with the team at University of Exeter and has conducted his own experiments with hydrogen sulfide. “Hydrogen sulfide regulates vascular function, inflammatory responses, neurotransmission in the brain, many different things,” says Szabo. This also includes potential for cancer treatment. “If you incubate cancer cells in the laboratory with hydrogen sulfide or a compound that produces hydrogen sulfide, you can do two things. At lower concentrations, you can stimulate the cells, and at the higher concentrations, you can kill the cells,” claims Szabo. Of course its never that simple, not when you’re facing something like cancer. Studies have already shown that certain cancerous cells (like ovarian and colon cancer) produce large quantities of hydrogen sulfide to help them survive and multiply. 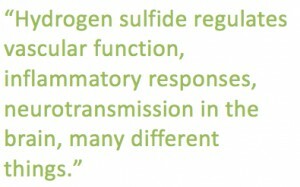 Dr. Szabo says that it has a lot to do with the sheer complexity of hydrogen sulfide’s own biology. There’s potential at both low and high concentrations. We invite you to delve more into this research yourself, but you aren’t going to find any scientific notes suggesting that we should start inhaling more farts.